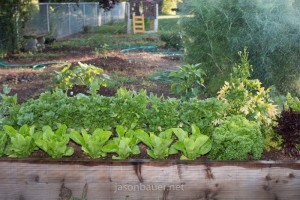 Raised beds in a veggie garden are really nice to use. They have so many benefits that it’s hard to describe just how much you’ll like them. They keep the majority of weeds back away from your plants. The only real weeding you have to do is the little weeds that pop up around your plants, and as long as you do that about once per week it’s really easy to stay on top of. They provide excellent drainage, so even if you have bad soil in them your plants will do better. They keep the underground critters like moles and gophers out if you line the bottom with some sort of wire. 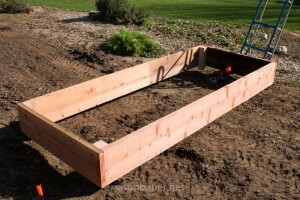 It’s easier to plant, harvest, and weed in raised beds because you can sit on the side, kneel in the dirt, or just bend over while standing. They’re really not that hard to build either. 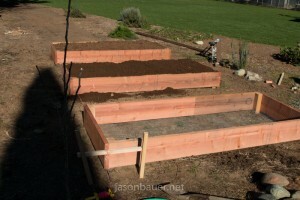 Our local lumber store gets a few units of 12″ tall redwood each spring just for making raised beds. 12″ tall is a perfect size for most people. The boards are rough sawed so they are a full 2″ thick, and they are green, so very heavy. Don’t bother trying to load up a 20 foot piece, it’s just going to be heavy. Instead, have the yard cut then down to size for you. Most lumber yards will make cuts for about $1 / cut. We paid $1.85 per linear foot, so it actually worked out cheaper than using #3 cedar since you’d have to run 2 courses of cedar and you only need 1 course with redwood. 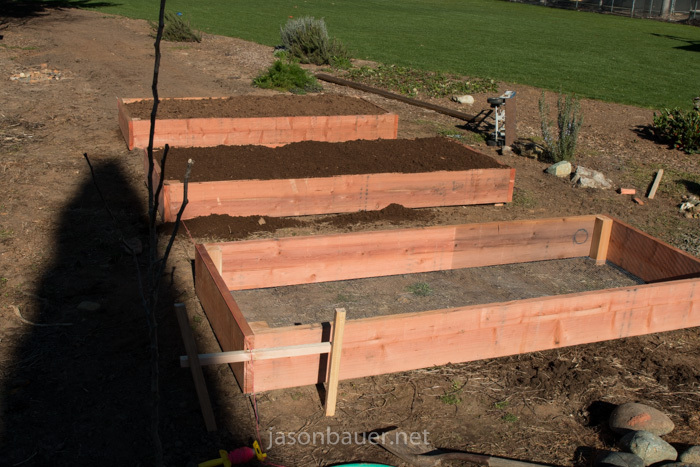 We made our beds 4′ wide and 10′ long which works out to just over $50 in lumber each. Throw in some aviary wire for the bottom and a 4×4 post for the corner and you can figure on $60 all said and done. Start by cutting your lumber down to length. We used 4′ long and 10′ long pieces. Then cut the 4×4 to slightly longer than 12″. Anything will work. If it’s too long you’ll just have to dig it into the ground a little bit. Drag the pieces to their final location and assemble the sides using the 4×4 posts to add strength. You’ll need 3 or 4 screws per side on each corner. If you have an impact drive this is the time to use it. You’re goal here is to make something that roughly resembles a rectangle. Now that you’ve got it assembled, stand it up on it’s side and attach the aviary wire. We used 1/2 crown staples with 1.5″ long legs, but just about anything will work as long as it holds the wire in place while you fill it. We were going to line the bottom with hardware cloth but it was over $1 / foot and seemed pretty beefy for the job. After looking around we found aviary wire. As long as you get the stuff with 1/2″ holes you should be fine. 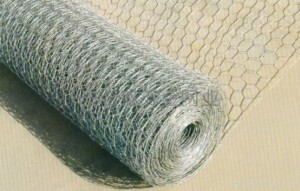 Here’s a shot of the wire that we used. It was roughly $0.50 / foot, so a 10 foot piece was about $5. Since we were doing 3 beds we wanted them lined up nice and square with each other. To do this we drove some stakes in the ground, which you can usually find in the concrete section of a hardware store. Then we stretched some masons line between the stakes and lined the beds up to the mason’s line. 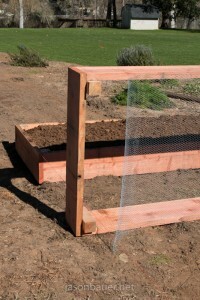 Once they were in place we filled them with compost. We used composted horse manure, but you could probably use just about any compost that you can get your hands on. The local sand and gravel store sells “top soil” which would work fine as well. 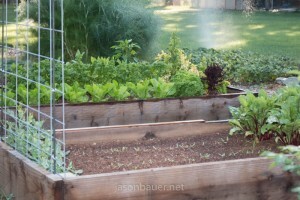 After filling the beds be sure to water them very heavy to settle the soil before planting. The soil is going to settle quite a bit and a nice heavy watering will speed that process up. We made our beds at the end of February, and here’s a picture of them at the beginning of June. 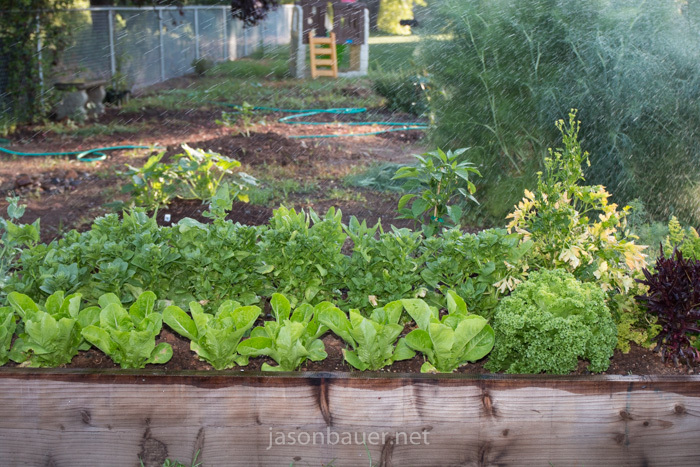 That’s our second planting of lettuce on the near side, spinach in the middle, a jalapeno pepper on the far side, and some herbs on the right. Everything is growing exceptionally well in them. You can see that the wood has already lost it’s nice red color, which is fine with me. If you want the wood to stay red I suspect a coat of garden safe oil would do the trick. You’ll probably have to re-coat it every year. Also, in case you were wondering, it takes about 5-6 full wheel barrows to move a yard of soil.